“Cities Ancient and Modern” students work on a street-scape for a neighborhood improvement project. 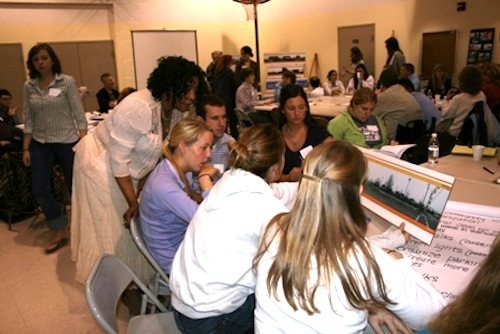 Service learning courses use community service and structured reflection as part of the text of the course in order to provide students with experience in applying concepts and skills to “real world ” needs. The activity undertaken during the course addresses a problem or concern identified by a community partner, and could include a wide range of activities, from environmental issues to educational needs of the community.